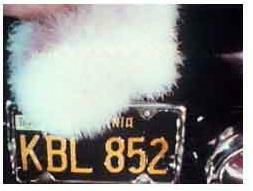 In Kenneth Anger’s film Kustom Kar Kommandos (1965, Kenneth Anger) sexuality and gender roles are constructed by the aesthetics of the filmmaking. Anger uses conventional cinematic technique and elements in unconventional ways to produce non-normative sexual meaning. 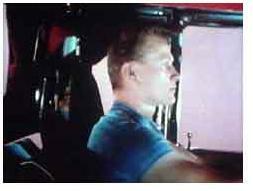 The first thing heard in Kustom Kar Kommandos is the sound of a revving car engine and the word “Kustom” appears on screen followed by a shot of the car, with the engine exposed. 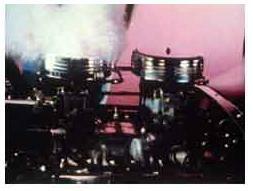 Then the word “Kar” appears and the film cuts to the two boys looking at the car engine. There is a cut back to the word “Kar” and then back to a tighter shot of the boys looking at the car. The message derived from the sandwiching of the two shots of the boys with the word “Kar” is literally the idea that the car will bring this couple together. After the second shot of the boys, the film cuts to “Kommandos” which completes the title. The title is deliberately misspelled, replacing the three C’s with K’s. KKK stands for Klu Klux Klan; another group of associated with white male togetherness and the word Kommando is derived from Commando, which means members of a trained military unit. In both ways the title suggests togetherness and violence, and also implies a relationship between togetherness of two men with sadomasochism as does the film Fireworks (1947, Kenneth Anger). After the revving of the engine and the two boys together, the song “Dream Lover” begins to play and we see the door of the car open towards the camera, as if we are invited to enjoy the car’s beauty. Then there is a dissolve to the seats inside the car seen together, in red leather. This dissolves to the exterior of the car where two shiny, metal, circular extensions of the engine protrude from the car. The boy rises from below the car into the shot, standing with his hands on his hips. The two metal objects perfectly frame the boy’s crotch. The shot of the seats and the metal objects conclude the importance of coupling to the film. The second shot framing the coupling of the metal engine protrusion with the male crotch, this implies these two things work in tandem. The car’s engine has the ultimate importance to the car and the boy’s crotch has the ultimate importance to the boy. Together these elements seem to drive all the other images seen in the film - they are working for each other. Anger even pushes in slightly on the boy’s crotch to drive home the message of the shot. The film dissolves to the first of four long seductive takes of the boy gently wiping down the car with a big fluffy ball. Each shot is separated by a wipe but all the movement is slow and deliberate, from both the boys polishing and the camera panning. While wiping down the car the boy is totally detached from the film as a recognizable figure, only his body is seen and not his face. As the boy is fetishizing the body of the car, Anger is fetishizing the boy as well. The emphasis of the film is not only to sexualize the car and its relationship to the boys but also to show the importance of the dressing up process. This process was also used by Anger to mock feminine displays in the film Puce Moment (1949, Anger). Dreyer says in his essay Underground and After, "The idea of dressing up as the assumption of an identity may be related to Jack Babuscio’s discussion (1977) of the ‘gay sensibility’ which stresses the absolute importance of mastering appearances and assuming identities in a gay life where passing for straight (assuming a straight appearance) is so critical." The car is essential in not only helping to create a couple but also in constructing the identity of the boy taking care of the car; it is his reflection. When the boy is finally done caressing the car he gets in and starts the engine. Two shots show him and the car working in a synthesis that does not seem to be contained by the shell of the car, again pushing how important both are to each other. The revving of the car engine again echoes the film’s beginning sound again reinforcing the idea of coupling, not just in the film’s structure but also because the revving engine reminds the viewer to associate that sound with the two boys together.